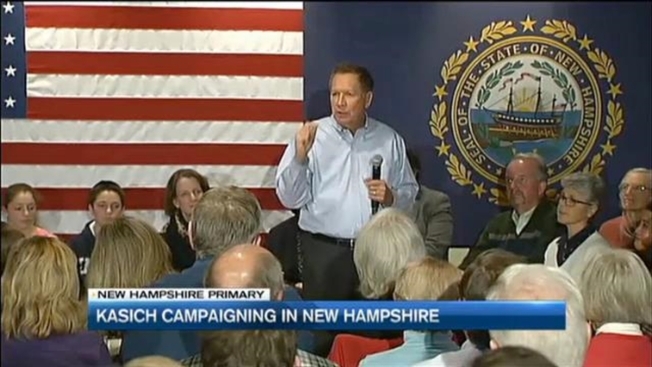 John Kasich is telling New Hampshire voters that the future of his campaign is in their hands. The Ohio governor and Republican candidate for president knows New Hampshire is a state where he stands to perform well in the primary, and it could be his much-needed break-out moment. "I really want to go on, and it's going to depend on this state," Kasich told his audience at a town hall in Durham Wednesday morning. His campaign has invested significant time and resources in the Granite State, holding 95 town halls as of Wednesday night. The effort appears to be paying off, as some polls have Kasich as high as second place. Branching out from the common Republican talking points, Kasich took questions about climate change, student debt and drug addiction. Kasich has called himself a moderate Republican who can appeal to both Democrats and independents. Refusing to go negative, Kasich declined to comment or attack other candidates during his appearances Wednesday. He said he will stay positive, and sees increasing attacks on him as a sign that his campaign is gaining momentum. "I hear Carly is attacking me now - it's fantastic," he said. Kasich appeared to comment on candidates like Donald Trump, when he said the best way to govern is calm, and strong. "Beware of bombast," he told New Hampshire voters. "You don't run foreign policy by yelling and screaming." Twice, Kasich told his town hall audiences that a poor showing in New Hampshire could mean he decides to suspend his campaign, and head back to Ohio. Bernie Sanders Speaks in N.H.